It’s that time of the year when pumpkin is EVERYWHERE. Seriously. I’ve considered taking photos of all of the random places I see pumpkin-flavored things these days- Starbucks, the grocery store, cosmetic stores, candle shops, clothing stores, the list goes on and on! I don’t know what gets people so crazed about pumpkin. Maybe because it signifies the start of fall and that cozy, crisp feeling (although I think that’s out the window ever since Starbucks brought back the Pumpkin Spice Latte in like, July). I am MUCH more of a sweet potato person (can I get an amen?) but I can get on the pumpkin bandwagon too, I guess. Just to be social. 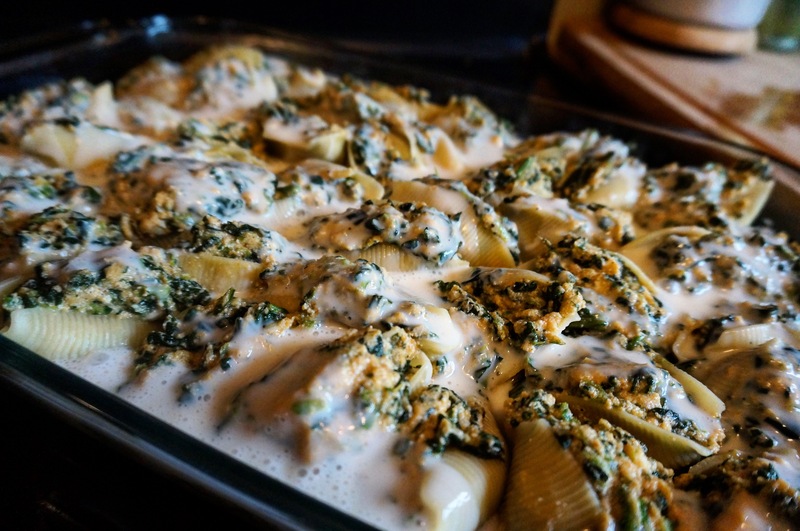 This recipe is a bit different from the ones I usually post. Noah Ben and I have had about 40 straight days of rain here and we’ve been craving all things comfort. Chicken casserole and split pea soup have been staples in our house for the last week or so. Gone are the days of Lentil Curry Salad and Heirloom Tomato & Summer Squash, my friends. But it’s ok. Life will go on! In other news… I saved this little guy from getting run over by crazy bikers like me this morning during my long ride. Poor little guy must’ve been washed up onto the trail by all this rain we’ve had! I snapped my shot and then very gently moved him into the leaves on the side of the trail. Stay safe, little turtle! Seriously though, isn’t he beautiful? 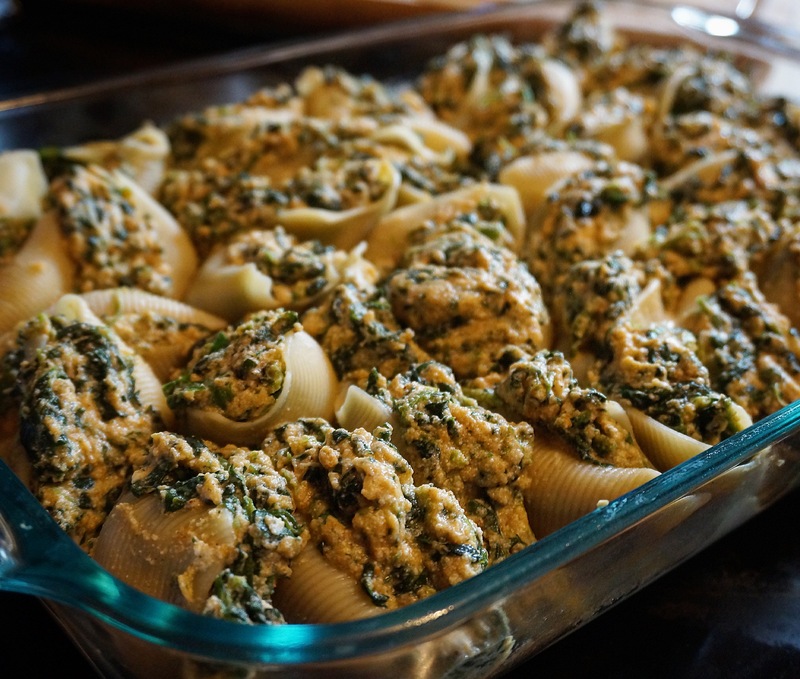 Anyway, these Pumpkin Ricotta Stuffed Shells are satisfying enough so that you can indulge with just a few and not feel like you’ve broken the calorie bank (just don’t get three Pumpkin Spice Lattes beforehand!). They’re cheesy, gooey, slightly sweet, and perfectly sized for easy portion control! I had four of the shells with a big spinach and green pea salad on the side, and I was completely satisfied. They are also freezable for those of you cooking for one or two, so you can save half of them for later and still have leftovers for the week ahead. This gooey, cheesy, slightly sweet but savory pasta is sure to satisfy your comfort food cravings for those rainy fall nights you’re happy to stay inside and enjoy #allthepumpkin! Happy Fall! Cook shells according to package directions, but 2-3 min less for al dente. Drain well and allow to cool completely, separating shells out on wax paper to avoid sticking. In a large bowl, combine pumpkin, spinach, ricotta, sugar, cinnamon, nutmeg, cayenne papper, salt and pepper, and egg. Stir to combine well. When cool enough to handle, spoon about 2 tbsp of filling into each shell. (I’ve found that it helps to “squeeze” the shell open first with your thumb and index finger and fill with the other hand!). 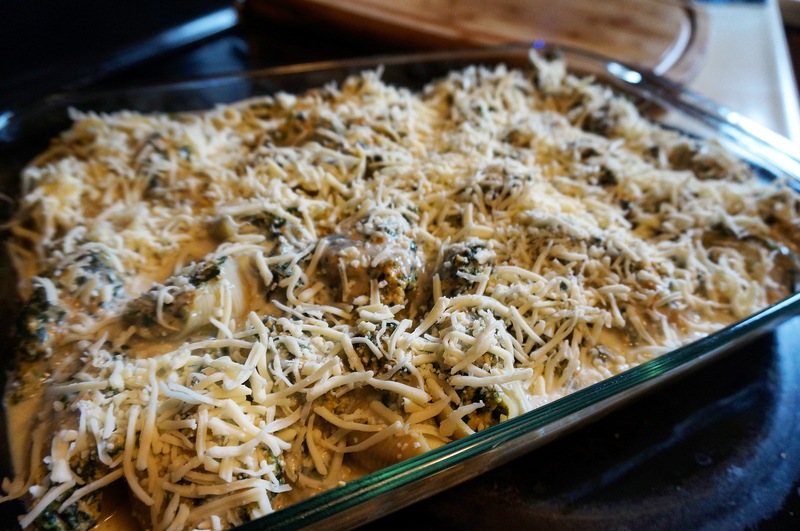 Spread 1/2 alfredo sauce in the bottom of a sprayed 9×13 casserole dish. Add milk to the rest of the sauce and shake to combine. Place shells side-by-side (they’ll be snug!) in the casserole dish and drizzle with remaining sauce. Top with mozzarella cheese. Bake, covered with foil, for 30 min. Uncover and bake for 15 more minutes until cheese is bubbly. Happy tummy! Hope you had a cozy fall weekend!